Encourage kids to discover the 220 most commonly used sight words with this fun and fast-paced game. Specially designed to teach the top dolch sight words, sight word swat challenges kids to see, swat, and learn! They’ll think they’re just playing, but parents and teachers will know they’re actually learning. Set features various game instructions for 1-4 players. 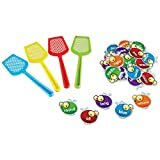 Includes 110 double-sided Sight-Word flies and 4 colorful swatters measuring 9”L each. 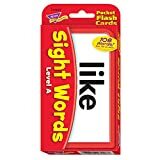 ✅ Award winning sight word flash cards for children in grade levels Pre. K through Grade 3. Our 12+ Awards include: 2018 Creative Child Magazine Product of the Year, 2018 Mom's Choice Award winner, 2018 Family Choice Award winner, 2018 National Parenting Product Award winner, 2018 Academics Choice Award winner, & 2018 National Parenting Center Seal of Approval. ✅ 54 two sided durable cards per pack with large bold lettering for easy reading. Coated flash cards come with 3 rounded edges and 1 angled corner for quick and smooth sorting. 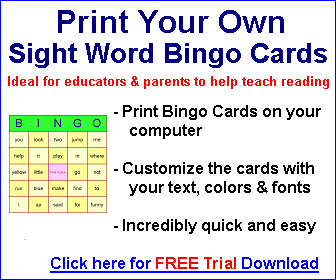 ✔ Educational sight words for beginning readers ages 3-9. ✔ 100+ sight words per pack that cover up to 75% of the words found in beginner children's books. ✔ Curated word list from Dolch and Fry to help prepare students grade levels Pre K through third grade for successful learning. ✔ Each pack comes with a sequence of 6 teaching techniques and 6 fun educational games for kids to learn sight words. ✔ Learning to read made easy with Pre-K, Kindergarten, 1st Grade, 2nd Grade, and 3rd Grade flash cards. 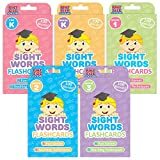 ✔ Think Tank Scholar Sight Words Flashcards help children to learn and practice reading the most common words found in a children's book. ✔ Help kids build their vocabulary and increase their reading skills by memorizing simple letter-to- sound high-frequency words that do not necessarily follow phonics rules. ✔ Learning to recognize these words without decoding them increases a child's reading speed accuracy, fluency, and comprehension. 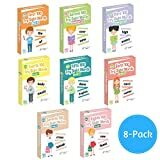 ✔ 6 teaching techniques and 6 learning games are included to help your children practice writing, spelling and build sentences. Providing simple learning resources for a first-time reader. Girls and boys can practice word activities to help their memory skills, key for tests. ✔ Our cards are designed to make learning fun for young learners with a non-distracting design and large bold print that helps students automatically recognize words. ✔ The flash cards are made from high quality card stock with a smooth laminated coating and rounded edges for easy sorting and handling. ✔ Teach your child over 500 basic words to master the reading skills needed for their level and beyond. ✔ The 6 fun sight word games included: Complete the Sentence, Create a Sentence, Interactive Sentence, Slapjack, Search the Deck & Word Hunt. Get 500 sight words developmentally targeted and curated from the Dolch and Fry word lists! Strong readers memorize them since they can't be sounded out. That's where these flashcards come in! Sight Words appear with high frequency in books read by children, but typically don't follow the usual rules of phonics. This means they're tricky, and young readers might not be able to sound them out! Strong readers and writers memorize and internalize Sight Words, which increases reading speed, fluency, and comprehension. And one of the simplest, easiest, and most effective ways to memorize your Sight Words is flashcards! Words selected by experts. 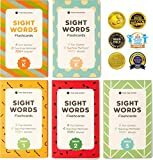 Each pack of Sight Words flashcards from Pint-Size Scholars contains 100 words curated from Dolch's classic list, as well as a selection from Fry's Revised First Sight Words, which means the whole set includes 500 Sight Words! And all are chosen by experts in their field. We've also included 5 useful techniques for teaching Sight Words, as well as 5 fun games to play. Designed for success. Each flashcard utilizes a plain design that doesn't distract young learners. Each card features two gentle slopes that guide the eyes naturally from left to right. Because young learners are taught them first, all words are solely in lower-case and appear on primary handwriting lines. And of course, we've made sure to use a thick card stock that isn't see-through! For your benefit, each card is color-coded by reading level and features a large rounded corner for quick sorting. GROWS WITH YOUNG PLAYERS: Includes 90 basic sight words and 30 advanced words for strong readers. An excellent board game for pre-school, kindergarten, elementary school, and homeschool students! Teach Children New Words on Every Slice & Topping of Sight Words Pizza! Sight Words appear with high frequency in books read by children, but typically don't follow the usual rules of phonics. This means they're tricky, and young readers might not be able to sound them out! Strong readers and writers memorize and internalize Sight Words, which increases reading speed, fluency, and comprehension. Now you can increase your vocabulary with a slice of pizza! 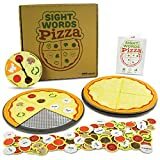 Sight Words Pizza reinforces and increases retention of new acquired sight words with fun, competitive gameplay that provides vital repetition. During a game young learners get several chances to read and interact with crucial sight words, all while assembling gooey, cheesy pizzas! In Your Order: You'll find 16 Pizza Slices, 4 Pizza Pans, 1 Spinner, 90 Basic toppings, 30 Advanced Toppings, 1 Rules Booklet. It can be a challenge to teach any child to spell and read. Why not make it a fun activity for them? And it's pizza! What kiddo wouldn't want a slice of that? With 120 sight words, 16 pizza slices, and 4 pizza pans, you'll have just as much fun as your child or student! An excellent tool for teachers, parents, psychiatrists, and more. Each bite-sized lesson will help your child succeed in literacy and fun! 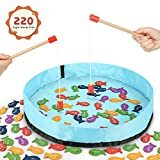 ★【Fun Way to Teach Sight Words】No child can resist a fishing game..and with this set, kids can actually focus on the sight words and not just the game! Each colorful fish is printed with a dolch sight-word. As children use the magnetic fishing rod to"catch & count" the fish, they learn to recognize sight-words more easily! Why choose Gamenote Magnet Fishing Set? Fun and Educational - Set includes 220 fish printed with the top 220 Dolch sight words, which are a selection of words found most frequently in children's books. Color-coded by level - Red for Pre-Primer; Orange for Primer; Blue for First Grade; Green for Second Grade; and Purple for Third Grade. 1. Set up the exercise by placing all the fish, on our fishing pool or the ground. Show the child how to catch a fish by dangling the fishing rod magnet near the fish's head to "catch" it, taking the fish off the line, and then reading the word. 2. As the children play the game, if they get the word correct, they keep the fish, making a pile by their side. 3. If they don't get the word correct, we give the child some practice with the word. Then we return the fish to the pool for them to catch again later in the game. 4. The game ends when all the fish are caught. For more repetition, you can go through all the caught fish. ✔ SELF-CHECKING - With a sentence on one side and the sight word on the other, you can easily check if the word is being read and pronounced correctly..
✔ 2 RINGS INCLUDED - This set of flash cards includes 2 rings to separate the examples that need practice from those that don't. ✔ TEACH AND REVIEW - It is deal for teaching, reviewing and practicing sight words, in the classroom as a whole or each child individually or in groups, at their level. Star Education Sight Words Flash Cards are great for teaching, reviewing and practicing basic sight words. It is ideal for beginner readers to teach them how to read. It is great for test prep too. ✔ Flashcards are a proven method to help improve learning. The old saying of practice makes perfect applies here. People who have used flash cards were proven to get better exam scores for this reason. ✔ It includes: 1 Sturdy Box. 169 Flash Cards. 2 Rings. ✔ The flash cards have 1 square edge and are hole-punched so you can sort the cards easily. ✔ The cards are approximately 3"x6", the perfect size for comfortable hand-holding. The letterings are large, bold and clear so it is easy to read even in a large classroom. ✔ The set includes 169 flash cards, which is all of the basic sight words. There are sentences on the back of each card with the sight word underlined. ✔ This is a great method for teaching visual learners either in the classroom or for your child at home. ✔ This is great for a fast learner to stimulate him or for the extra practice a child needs. With these cards you can teach a child at the level they are up to. ✔ Ring 'Em Up: Compete with a friend to collect cards on your inder rings. Whoever collects the most wins. ✔ Word in a Flash: Get creative and use the sight word in a sentence to tell a story. Make the game even more challenging by adding a second word. ✔ Or just use your creativity and come up with some games on your own! Make reading fun and get your set of Star Education Sight Words Flash Cards today! Strengthen reading skills with most-common basic sight words, per the Dolch and Fry reading lists. Durable, no-see-through cards with quick-sorting, rounded corners. Great for school, home, travel. Flashy by design! Build student confidence and skills using fun-filled flash cards. This pack, complete with activities, strengthens growing reading skills with basic sight words. Watch students enjoy learning and build skills on their own or with friends ... at school, home, or on the go! Durable, no-see-through cards with quick-sorting, rounded corners. 56 two-sided cards, 3 1/8" x 5 1/4". Sight Words, also called high-frequency words, constitute up to 75 percent of children's elementary school text. Sight words typically don't follow phonetic rules and therefore are too tricky for young readers to decode on their own. Memorization of sight words leads to automatic recognition of a word even before attempting to read, allowing the child a chance to concentrate on comprehension without having to spend time stopping and decoding every single word. Memorization of these words is ideal as it leads to increased reading confidence, faster reading speed and better comprehension skills. Each of the 8 packs from Little Champion Reader contains 100 sight words extracted from Dolch Fry Word List. Using sight word flashcards is the simplest and fastest way to memorize those sight word lists!